Michelozzo was a Florentine architect and sculptor. He worked for Ghiberti on the doors for the Baptistery in Florence and later with Donatello. 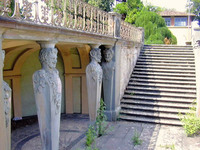 He succeeded Brunelleschi as master builder of Florence Cathedral and designed many villas he designed for the Medici family, including the Villa Careggi, Villa Caffagiolo and Poggio a Cajano.